Probably even more transformational is the Open Educational Resources (OERs) approach. OERs are released under an open license that permits their free use and repurposing. OERs include open textbooks as well as other materials that support access to knowledge such as lesson plans, full courses, and tests. OERs usually are funded by government agencies or foundations such as the Bill & Melinda Gates Foundation and the William & Flora Hewlett Foundation. In 2009, for instance, Congress included in the American Recovery and Reinvestment Act $2 billion for grants for community colleges to develop educational and career training materials that would be released under a Creative Commons CC-BY license. 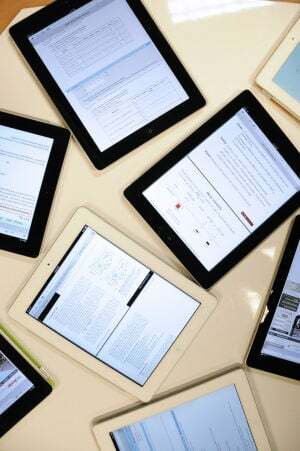 Digital textbooks, or e-books, could become popular in classrooms at N.C. State. Currently, students may choose between buying an e-book or the hard copy version of a textbook. Mike Nowlin, the textbook manager at the N.C. State bookstores, said that because publishers are beginning to lean away from the sale of regular textbooks, the use of e-books could become much more common. Will Cross, the director of copyright and digital scholarship center, said that the popularity of e-books is a response to the fact that regular textbooks are extremely expensive, which makes it difficult for many people to obtain a college education. “I think that e-books, open textbooks and alternate types of course readings are a great solution to the problem of textbooks increasing in costs every year and making it harder for students to get through school,” Cross said. According to Cross, in 2010 N.C. State started a project to create an open physics textbook to serve about 1,300 students who take Physics 211 and 212, the book is offered free online but can be printed for $40. “The libraries spent about $1,500 to acquire the site license for the textbook and now each student is saving $300 to $400 a year, so you’re looking at tens of thousands of dollars of savings for students,” Cross said. Cross said that due to the success with the Department of Physics, the libraries are searching for a new department, such as chemistry or biology, where they can implement this program. Danny Ibrahim, a senior in biology, said that he does support the use of e-books because students save money. “An e-book keeps you organized as well because all the information you need is in one place, you don’t have to carry a large book around and once you’re done with the course it saves you the hassle of trying to find somebody to sell your textbook to,” Ibrahim said. Still, Nowlin said that, currently, there is not a great demand from students for the purchase of e-books. “The licensing agreements for e-books usually last for only six to eight months and because of the price it isn’t being viewed as economically feasible compared to buying a used textbook, which is less than what an e-book costs,” Nowlin said.